11 years and up only. The course starts at the main event start line with the 2k runners and follows to the back of the "Classroom Barn" where it then turns sharp left and follows the main race course. It then follows the outer part of the course shown on the map below before making a sharp left and left again at the opposite corner. This will take you to the start of the 2nd lap at the Tractor Stop. Where the 2k runners turn left at the Witches House, the 5k runners carry on down the main race course towards Poplar Woods. At the bottom of the hill turn right and follow through Poplar Woods alongside Monks Dam and over the bridge. There will then be a sharp left and right to then head towards the Troll Bridge. At the Troll Bridge take a sharp left up the hill and from this follow to the main event finish line. For any that can't make the 45 minute time limit, the finish will be at the Tractor Stop. ​The 2k starts alongside the 5k and the course starts at the main event start line and follows to the back of the "Classroom Barn" where it then turns sharp left and follows the main race course. This will take you the start of the 2nd lap at the Witches House and the 2k runners separate from the 5k runners. Follow the inner lap with the 1 mile marker as shown below. From this follow to the main event finish line. When crossing the finish line can participants follow the funnel and stay in the order they finish and at the end of the funnel is the goody bag collection. There is a Trophy for 1st/2nd/3rd Boy and Girl presented at 7pm. For the 2k/5k there is a combined race entry limit of 150 so it is best to pre enter to guarantee entry. There will also be a 45 minute time limit. 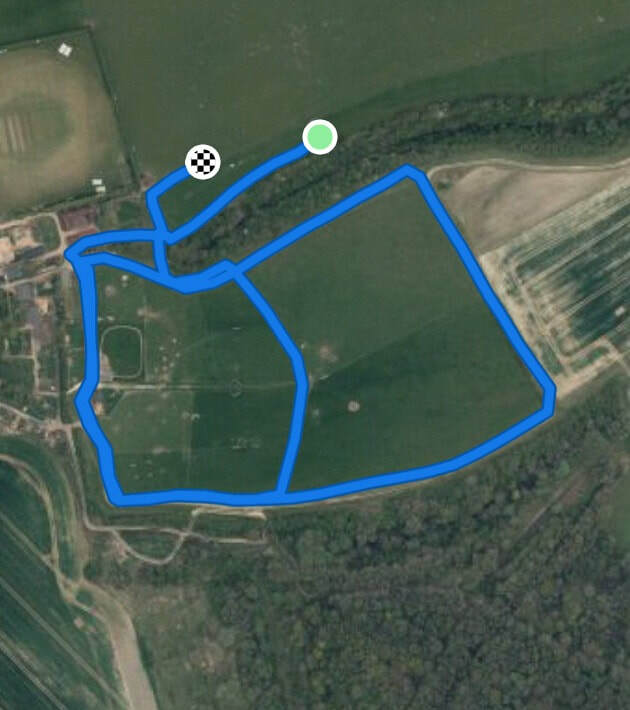 Anyone unlikely to complete this at the 4.5k stage will not be allowed to complete to the gantry finish but will be allowed to finish the 5k further around the course at The Tractor Stop and their time will be classified as 45:00. Thank you to everyone who entered the 2017 2.5/5k Fun Runs. We hope you enjoyed a fantastic event on a very hot evening which saw an increase on the previous year in 2016 entry of 12 to an over whelming entries of 108 in 2017, with 71 in the 2.5k and 37 in the 5k. This of course gave us some unexpected challenges which we dealt with well. We felt prior to the event we gave more than adequate notice and description of both courses by posting via Strava both courses on our Facebook page and this website, but despite this we're aware that a number of runners missed out a section of the course resulting in some claiming prizes claimed that should not have been. As of now I haven't yet received the list of on the night winners but in the spirit of fairness and this is ultimately a 'Fun Run' we have come to a conclusion in order to bring some kind of closure. However, if someone doesn't agree with this, we will be happy to look at this by emailing desborough10k@hotmail.com. As a result of this we will not be displaying a full set of results but they will be available for future scrutiny.